The Vancouver Condo Buzz » From $249,900! Parkside at Victoria Hill New Westminster Condo Tower & Town Homes by Onni > Spectacular Views & Pricing at the New West Parkside Condos & Townhouses Now Launching! From $249,900! Parkside at Victoria Hill New Westminster Condo Tower & Town Homes by Onni > Spectacular Views & Pricing at the New West Parkside Condos & Townhouses Now Launching! HIGH-RISE LIVING IN NEW WESTMINSTER’S MOST CELEBRATED MASTER-PLANNED COMMUNITY > Introducing the New Westminster Parkside condo tower at Victoria Hill neighbourhood by Onni Developers! Coming early Spring 2012, the Parkside Victoria Hill New Westminster condos and town homes will be this neighbourhood’s latest outstanding high-rise. With the presentation centre geared for an early Spring launch, you can now register for this great opportunity to purchase a new Parkside Victoria Hill New Westminster condo for sale! Here are some incredible features of the Victoria Hill New Westminster Parkside condo tower: the sixty five acre community (master planned by Onni Developers) will boast over forty acres of public green space and a pedestrian over pass that connects you directly to Queens Park and all of its great amenities and conveniences. The preconstruction New Westminster Parkside Victoria Hill condo tower will be designed by award winning IBI Group. The location of the new Parkside New Westminster condo tower and town homes in the master planned Victoria Hill neighbourhood is unparalleled, as it is situated in an elevated site, and thereby offering stunning views of the Fraser River as well as the North Shore mountains and beyond. The Onni Parkside New Westminster condo tower will be 22 storeys in height and will also offer a boutique collection of ground level town homes. Visit http://www.onni.com/parkside/ for all the updated information about this incredible project. We’ve included new renderings, images, maps and the site plan of the Parkside at Victoria Hill New West condo tower and town houses. The New West Parkside Condos and Town houses are now being marketed as a: Modern Community Immersed in Acres of Green Space. This is very exciting for prospective homebuyers who will be greeted with an amazingly designed Victoria Hill Parkside New West condo tower of 22 storeys in height. Located in the north east corner of the master planned, award winning Victoria Hill New West real estate community, this IBI Group Architect designed glass and steel tower is being offered by the Onni Group, a master builder of multi-family housing in the high-end yet affordable market. In addition to the 22 storey high-rise, the New West Parkside Town Homes will also be released. There are only 22 opportunities for the Parkside New Westminster Town Homes community, which feature ground level entryway, low-rise multi-level living that is perfect for couples and families. 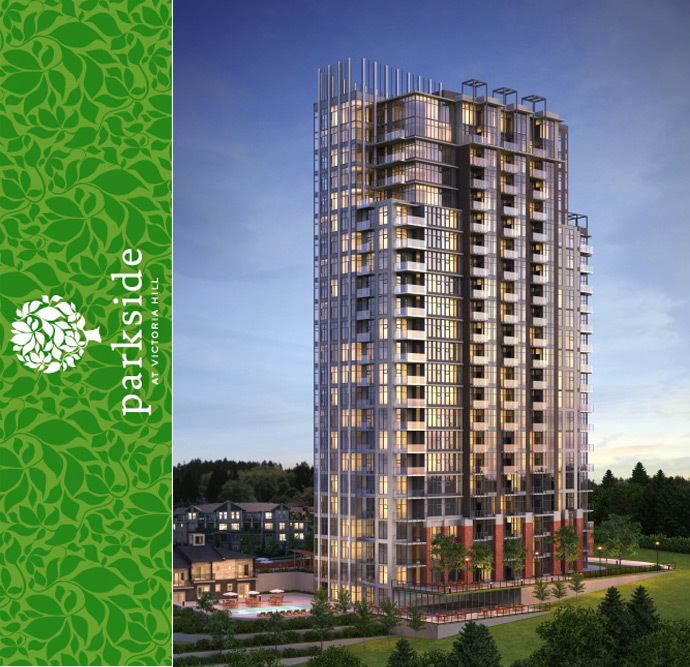 The estimated completion date for the New Westminster Parkside at Victoria Hill condos is slated for April1 2015 and the deposit includes 25% total down payment with only 5% required at offer. The New West Parkside condos and townhouses are part of the master planned Victoria Hill New Westminster real estate development by Onni and the on site amenity spaces will include guest suites, meeting room, outdoor pool, sustainable standards in materials and construction, fitness gym and a resident lounge. There are contemporary single lever American Standard faucets with pull down spray in addition to wood cabinetry with white oak or walnut veneer with soft closing mechanisms and stainless steel pulls. Also, the new Parkside New Westminster condos for sale will feature solid granite slab or composite stone counters with under mounted sinks in addition to the National Home Warranty. Here’s an added plus for the New Westminster Parkside at Victoria Hill condos and townhouses > all homes have parking included. Inside, your Parkside New Westminster condo or townhome feels timeless, classic and welcoming – an ideal balance of ageless elegance and contemporary comforts. The New West Parkside condos will feature a breathtaking 22 storey tower designed by award winning IBI Group with sweeping 180 degree views of the Fraser River and beyond. There are 2 colour schemes: Queens and Glenbrook that are distinctively different but both very high-end and sophisticated. The Onni Parkside New West condos and townhouses will also feature premium bevel edged single plank laminate floors in either African Ebony or White Oak as well as berber style trackless carpets in the bedrooms and floor to ceiling glazed windows in the living rooms. The preconstruction New Westminster Parkside condos and townhouses will have one inch horizontal Ventian style blinds for added privacy and all homes will feature full sized Whirlpool front loading stacked washer and dryer that are energy efficient. There is wire shelving included in all closets in addition to pre-wiring for high speed internet, telephone and cable. The bathrooms at the Onni Parkside New West condos and townhouses will include Walnut or White Oak veneer cabinetry with soft closers in addition to brushed stainless steel hardware as well as soaker tub and/or glass enclosed shower with single lever, pressure balanced valves. The bathroom counters are either stone or granite surfaces with under mount sink and the tub and shower tiled surrounds are large format. The New Westminster Parkside at Victoria Hill condos and townhouses will also have contemporary vanity lighting, polished edge vanity mirrors, polished chrome accessories and luxurious heated floors for the master ensuite bathrooms. The kitchens at the Onni Parkside New West condos and townhouses will have a spectacular high-end stainless steel GE appliance set for the kitchen that is Energy Star rated in addition to matte finished ceramic tiled flooring, warm track/pendant lighting, under cabinetry lighting and full height ceramic tiled backsplashes. As well, the kitchens at the preconstruction New Westminster Parkside at Victoria Hill condos and townhomes will feature American Standard faucets, under mounted extra deep double bowl stainless steel sinks, solid granite or composite stone counters and over height upper cabinetry with convenient pantry style shelves for certain homes. The kitchens at the New Westminster Parkside condos will also feature wood cabinets with soft closing mechanisms. All homes will be built and designed following LEED standards and the SkyTrain and bus loop are just minutes away by foot. IN addition, on site trails and greenways run through the Victoria Hill New Westminster master planned neighbourhood and there is a well lit underground parking garage. Marketed at New Westminster real estate’s best condo high-rise tower value, the new Parkside at Victoria Hill New West condo residences and townhouses are putting their final touches on the new presentation centre and VIP Launch coming late March 2012! The starting price point is set, and prospective new homebuyers looking for true condominium value in a master planned new community will certainly enjoy this: The New Westminster Parkside Condos & Townhomes will start from just $249,900! 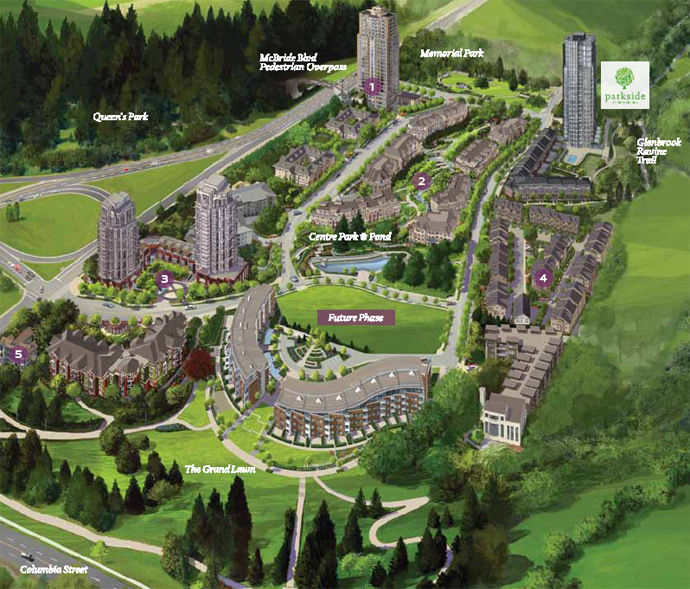 There will be a fine collection of floor plans and multi-family townhouse plans to choose from in this Victoria Hill New Westminster real estate community which encompasses 40 acres of public green spaces and a direct connection to Queen’s Park via the McBride Pedestrian Overpass. True New West condo value also starts from just $249,900. Set within the award winning Victoria Hill community with homes starting in the mid $200’s, Parkside New Westminster condo tower residences is the best high-rise value in this part of the city. In addition to the affordability, the Victoria Hill Parkside New West condos will also showcase over 5500 square feet of amenity spaces for resident use. These private amenities at the Victoria Hill Parkside New Westminster condo community will enjoy beautifully finished and furnished lounge clubhouse relaxation area, a theatre room, fitness studio designed by professionals as well as an outdoor pool! This is the first project in the Victoria Hill New Westminster real estate district to have such great amenity spaces just for its residents. Not only that, but the affordability comes with added bonuses that include spectacular views. The Victoria Hill Parkside New Westminster condos feature stunning views from the Fraser River to Mount Baker. Of course, the higher you are in the high-rise residences at the Parkside New West condo tower, the better the panoramas. The preconstruction New West Parkside at Victoria Hill condos are coming this Spring 2012 and are presented by Onni Developers. VIP launch is coming soon so stay tuned and register your interest today! Why Choose New West’s Victoria Hill Neighbourhood? Affordability and location are the key selling features for the new Parkside New West condo tower and townhouse residences. Affordable New West condos start from the mid $200’s, which makes it one of the best valued properties in the New Westminster real estate district based on price per square foot. These new Parkside New West condos are affordable but also well finished with high-end features, gourmet chef inspired kitchens and opulent bathrooms. The open concept floor plans are also very spacious, giving way to large outdoor living with most suites providing views of the water and/or city. Affordable New West Parkside condos at Victoria Hill are amazingly designed in every way by Onni Developers. In addition, location, location, location is the key to the success of the award winning New West Victoria Hill neighbourhood. Here, residents at the Parkside at Victoria Hill New West condos and townhomes will be close to all sorts of recreational options that includes the Riverboat Casino, Summer Softball Diamond, the Millennium Trail, Royal City Curling Club and Lacrosse Hall of Fame in addition to the Canada Games Pool & Fitness Centre, Sports Fields and Mercer Stadium. Also within New West’s Victoria Hill neighbourhood and within walking distance are medical and medical and civic services that include 10th Street MediCentre, City Hall, Glenbrook Pet Care Hospital, New West Wellness Centre and Royal Columbian Hospital. Cultural things around the Parkside at Victoria Hill New Westminster real estate development by Onni Developers are close to Massey Theatre, Royal City Musical Theatre Society as well as the New West Public Library. Schools within a few minutes distance include Douglas College, Ecole Glenbrook Middle School, Herbert Spencer Community School and New West Secondary School. The dining options near the Victoria Hill New West Parkside condo community includes The Boathouse, Heritage Grill, The Old Bavarian Haus, Victoria Sushi and The Keg just to name a few. Shopping at Royal City Centre, Royal Square Mall, Columbia Square and Crest Plaza in addition to a multitude of big box retailers are also within a few minutes of New West’s Victoria Hill Parkside Condos and Townhouses. 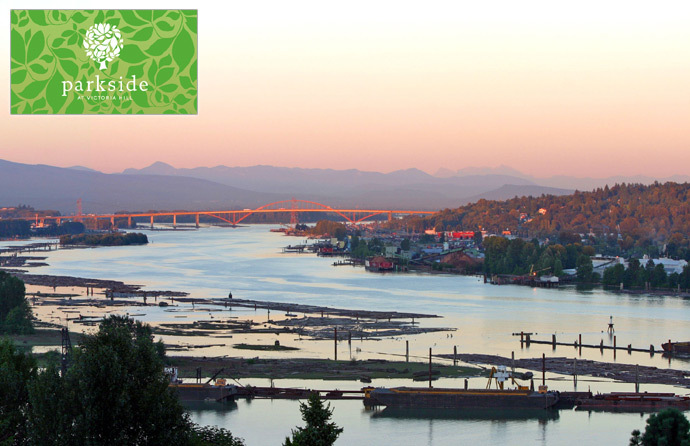 Grocery stores such as the River Market at New Westminster Quay, Thrifty Foods, Safeway and Save on Foods are seconds away. Also, there are numerous public parks and green spaces nearby and downtown Vancouver is only a 25 minute drive away. Other transit routes from the Victoria Hill Parkside New West condos and townhomes include the SkyTrain Line at Columbia Station and Sapperton Station. Also, it’s a bridgeless commute to Vancouver and walkable to the beautiful Quay area. Again, the preconstruction New Westminster Parkside Townhomes and Condos are located in the northeast corner of Victoria Hill neighbourhood which will eventually be home to 1200 homes over 65 acres of space complete with master planned green spaces. Also, the unique slope of the Victoria Hill New West real estate location site provides a perfect natural stage for panoramic views. There are also 3 beautifully restored heritage buildings within the community, located in historic New Westminster BC. All of the building phases have been carefully designed and planned to fit seamlessly within this village setting, including the new Parkside at Victoria Hill New West real estate community. Each compliments each other.